Durante dois anos o jornalista e escritor Alexandre Augusto fotografou o cotidiano de trabalhadoras da Chapada Diamantina, região do interior da Bahia, no Brasil, que ganham a vida quebrando blocos de pedras. O resultado surpreendeu: mesmo diante da aridez da paisagem e da aspereza do trabalho, as Mulheres de Pedra conseguem equilibrar força e delicadeza, como ressalta Roberto Pompeu de Toledo, que assina o prefácio do livro - "Eloquente é o detalhe do esmalte nas unhas das trabalhadoras. Uma das fotos mostra a mulher de costas, o braço direito levantado, a talhadeira na mão, prestes a dar o golpe - e faz vislumbrar a unha do polegar pintada de vermelho. O esmalte trabalha contra a lógica da pedra, da dureza e da pobreza, e berra aos céus que se trata de mulheres”. Depois de duas exposições com grande público e repercussão no Brasil - na Unibes Cultural, em São Paulo, e no Teatro Gregório de Matos, em Salvador - Mulheres de Pedra toma forma de livro e novamente nos convida a um mergulho na grandeza do feminino. 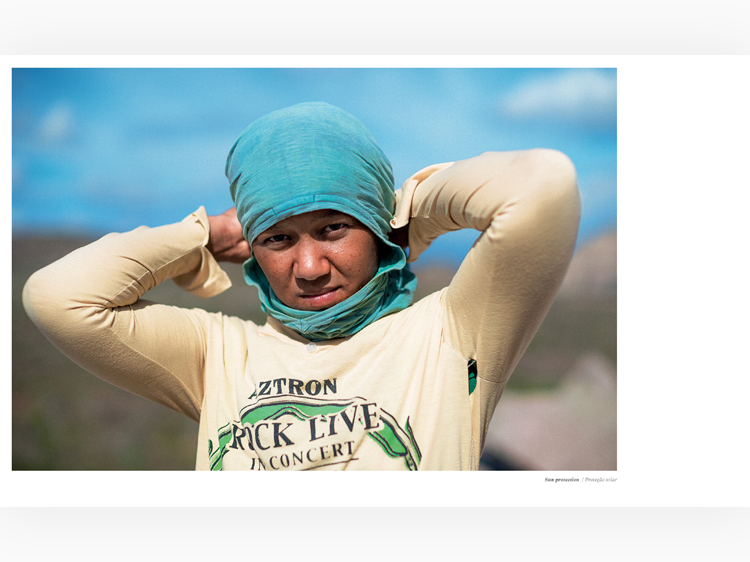 For two years, journalist and writer Alexandre Augusto photographed the everyday lives of female workers who make a living out of breaking blocks of stone in Chapada Diamantina, a region in the interior of Bahia, Brazil. The result was surprising: despite the dryness of the landscape and roughness of the work, the Stone Women are able to balance strength and grace, as Roberto Pompeu de Toledo, who signs the preface of this book, put it: “Nail polish is an eloquent detail in the hands of those workers. One of the pictures portrays a woman with her back turned, her right arm raised, holding a chisel, about to strike a blow – and we get a glimpse of her thumbnail painted red. In another, where only the arm and the hand are framed, the fingers resting on the rock, as if caressing a friendly surface, her five painted finger nails are revealed. The nail polish works against the logic of the stone, against hardship and poverty, screaming to the skies that they are women”. After two very well-received exhibitions in Brazil – at Unibes Cultural, in São Paulo and at Gregório de Mattos Theatre, in Salvador – Stone Women now takes the shape of a book and, once again, invites us to plunge into the greatness of the feminine. "Alexandre focused on the women. Stone Women tie pieces of cloth around their heads to protect themselves from the sun, as Arab women do as a sign of privacy and humbleness."